Outdoor soccer cleats come in four different outsole patterns -- soft ground, firm ground, hard ground and turf -- each matched to a type of playing surface. You'll want to invest in a sufficient number of surface-specific shoes to cover the types of fields you typically play on. While firm ground or FG cleats are the standard for play in the U.S., hard-ground or HG cleats may be more appropriate for certain surfaces. Firm-ground cleats typically feature 12 medium-length, molded studs, in either a circular or a blade shape, that cannot be removed. 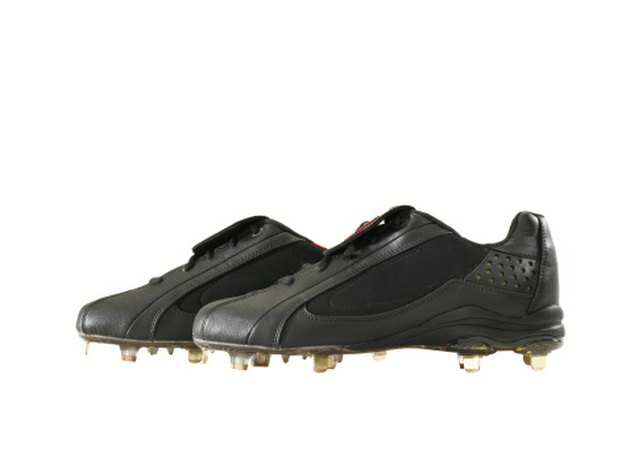 FG cleats are considered a "universal shoe" that will work on most surfaces. Two forms of polyurethane comprise the outsoles, a harder formulation in the tip for durability and a softer one at the sole and stud base to cause less stress on the foot, writes soccer author Joe Provey in "The Confident Coach's Guide to Teaching Youth Soccer." Hard-ground shoes typically have a dozen shorter circular studs in a group of four near the toes, four between the ball of the foot and arches and four in the heels. "The more studs, the more evenly a player's weight is distributed and the better suited the shoe is for playing on hard ground," Provey writes. Firm-ground cleats work on a typical grass field. Hard-ground cleats, as the name suggests, are adapted for a hard, dry-grass field or one with synthetic grass. Turf shoes, which have a pattern of dozens of rubber nubs instead of cleats, work for artificial surfaces of low-pile, carpet-like yarns rather than synthetic grass. Soft-ground shoes work well in muddy conditions. These feature six replaceable studs that can be circular or blade shaped and in different lengths. Manufacturers are exploring ways to have a single shoe function as both a hard- and a firm-ground shoe. In 2009, Adidas bought out an F50i Tunit cleat, worn by Argentina's Lionel Messi and other speedy players, with customizable studs for hard, firm and soft ground, changeable with the use of a stud key, as well as two different chassis, a standard and a competition version. The soft-ground studs comprise four 18 mm studs for the heel and 12 15 mm studs for the forefoot. The firm-ground version has 15 mm heel studs and 12 mm for the forefoot, and the hard-ground studs are 13 mm for the heel and 10 mm for the forefoot. In 2010, Nike bought out its Mercurial Vapor SuperFly, which relies on a stud that can move up to 3 mm depending on whether the ground is firm or hard, adopted by Portugal's Cristiano Ronaldo, Clint Dempsey of the U.S. and Didier Drogba of the Ivory Coast. Bring hard- and firm-ground cleats and turf shoes to your games and start wearing whichever you think is most appropriate during warm-ups, recommends Lorrie Fair, a pro player with women's team the Philadelphia Charge, now disbanded. Change before game time if your shoe doesn't allow you to run and cut properly on the field. If it rains or the ground thaws during the game, you can make an adjustment at halftime, she advises.